​Did you know that you can get pure maple syrup, right here in Pennsylvania? In 2016 alone, Pennsylvania sugar-makers produced more than 140,000 gallons of maple syrup! That’s more than 5-million-dollars’ worth of maple syrup. Somerset County is the largest maple-producing county in the state. It’s there that you can find Emerick’s Pure Maple Products—a small, family-owned operation that began in the 1950s and is now operated by Matthew and Stephanie Emerick, with the help of Ed Emerick (Matthew’s dad). With about 4,200 taps they produce, on average, 2,000 gallons of syrup a year, which means they process more than 120,000 gallons of sap! The Emericks learned everything they know about sugar-making through trial and error over the past 60 years. Back in the day, when the business was operated by Ed, the trees were tapped and hung with buckets that had to be collected daily. And, the average crop was a quart of syrup per tap. Now, with the help of tubing and vacuums, the goal is half a gallon per tap. The vacuum system pulls sap from the trees and dumps it into tanks spread throughout the woods. The sap is then trucked in on pickups to the Emericks’ sugar house. Maple-syrup-producing season runs from approximately February through mid-March, give or take some time depending on the weather. It needs cold nights, about 25 degrees, and warm days, 35-40 degrees. The flavor and color of the end-product is 100% weather-dependent. So, you may be wondering, what exactly goes into the making of pure maple syrup? It all starts in the woods with tapping trees and gathering sap! Sap straight from the trees is only 1.5-2% sugar, and pure maple syrup, like you put on your pancakes, is 66% sugar. That means more than 60 gallons of sap is needed to make just one gallon of syrup. Remember that the next time you think pure syrup is expensive! Once back at the sugar house, the sap is run through a reverse osmosis machine that uses membranes to help push the water out of the sap and concentrate it before evaporating. Sap goes in at 2% sugar and comes out at 15%. After concentrating with reverse osmosis, it takes only six gallons of sap to make one gallon of syrup; saving time, fuel, energy and money. Next up is the evaporator! Sap goes from reverse osmosis into the 4’x12’ oil-fired evaporator, where they use one gallon of oil per two gallons of syrup produced. After evaporating the remaining water from the sap, the syrup comes out at 66% sugar, but there’s one more step to go. When it comes out of the evaporator the syrup is cloudy, so it’s run through a filter press before going into barrels for storage. 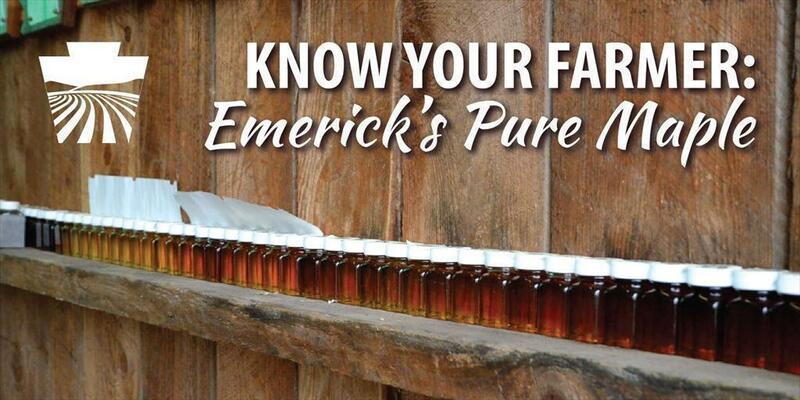 The Emericks package syrup from the barrels all year long, as they receive new orders. Before packaging, the syrup is graded based on color. To be considered one of the four grades, the syrup must be “equal-to or lighter-than” that grade – if it’s darker, it’s bumped to the next grade. You can find Emerick’s Pure Maple Products in markets from New Jersey to Ohio, mainly at farm stands and fruit markets. While they do sell some product outside of Pennsylvania, their main goal is to provide good Pennsylvania syrup to Pennsylvania stores. Their biggest buyer is the Philadelphia Common Market – a local food hub with a mission to only provide local foods from within 250 miles of Philly. You can also find the Emericks at the Pennsylvania Farm Show every year. There, you can taste the different grades of syrup and take home a bottle of your favorite! At last year’s show, they won Best Collective Exhibit. If you’re traveling through the Laurel Highlands region, be sure to visit the Emericks in Hyndman! You can also find them online at www.puremaplesyruponline.com.